We are VERY excited with this "new" CD. It's two of our early albums put together on one CD. AMABUTHO is our 1st album, released in 1973. ISITIMELA is our 4th album, released in 1974 and one of the best albums to hear the great early voices of Ladysmith Black Mambazo. Two albums, 24 songs all at the price of one cd. Our new CD "Always With Us" is a tribute to our group and family matriarch, NELLIE SHABALALA, who passed away in 2002. 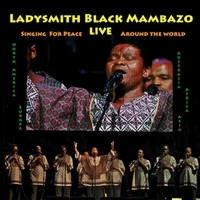 This collection of ten beautiful songs features Ladysmith Black Mambazo singing with Nellie and her church choir. You can hear some of the songs in the "Listen To Music" section of our website. 2013 Grammy Award WINNER for Best World Music CD. This is for Hard Disc CD shipped to you. Hard Disc ONLY Available in USA for now. All Other locations PLEASE buy download below.